Mid-December, I thought about very quietly taking a break from posting politics for a week come New Year's. No, I'm not ashamed of my politics. I'm quite proud of them. They didn't come easy to me, and I can explain why I believe what I believe. I like talking about them to people who actually comprehend them (even if they don't agree) instead of shouting theirs back in my face without listening to a thing I'm saying. But being as they were inspired by some really private things, it's sometimes inappropriate to bring up these things, despite my lack of shame over them. I realize that the reason I've gotten into posting politics on Facebook was just a few short years ago, I was miserable. I didn't like myself, and I wanted to control a lot of things because I thought I knew that if I controlled other people, they'd be happy and I'd be happy. When I finally entered treatment at the end of my rope at the end of 2012, I started to learn that I can't control other people and expect them to be happy. I can't let another person control me and expect happiness out of that either, because another person creating your happiness will always do it incorrectly. I realized only I can make myself happy, and I can control it. Trying to control others pushes them away. And I realized that, when people have politics that shaped from cowardice and racism, I could help them, but it's difficult, and honestly? They're not very good people, so why am I trying? In short, I found my self-esteem. I went through an "I don't give a crap" phase on Facebook where I posted whatever I wanted and would tell people who criticized me, "I don't care" and I'd slap them on my restricted list. I used to be scared to use the restricted list, and then I realized, they don't deserve my thoughts on social media. And truly, I still don't care if they want to tell me to not post what I'm posting. They don't control my sense of self. And their trying to control me is them being who I used to be. They're miserable. Control freaks. Why would I want to let them that deep into my life? 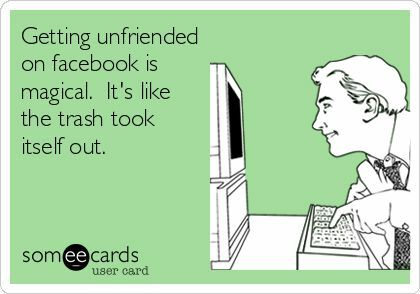 And yes, I've lost friendships on Facebook because they hate my politics so violently. I've even been blocked a few times for supporting gay rights, supporting freedom of religion for Muslims in America, supporting being honest, and campaigning against racism (and I don't miss their racket, trust me). A lot of the time, I'm relieved, too. But, I realized I don't need to post my politics to believe in them and for them to be strong. I'm a registered voter, and that's all I need. I don't owe anyone an explanation if I find their politics repulsive and I make the choice to unfriend them, and the response from their friends who want to start drama. Since I've been in recovery from depression (which I could fall off the wagon from at any moment if I'm not careful, knock on wood), I've realized if people I care about don't notice me or care about me, they're not very nice or good people worth my feelings. Why should I pursue their friendships? What a waste of time! Nowadays, I like myself, I like my friends, my friends check in on me (it's no longer a one-sided relationship), and that's all I need. Has it been difficult to not post politics that are close to my heart, like supporting the Syrian Refugees plight to safety? Initially, and it will probably be difficult later. And the glee of seeing certain political candidates for President bow out of the race (OMG, OMG, OMG!). But I have people I can talk about that with over Direct Message (and share my Schadenfreude glee). It was really difficult when Obama finally agreed to executive action of guns, too. I can still like political memes and links, I can comment on them, too. But I don't need to argue with people or cause a fight by posting them to my wall. I wanted a cause to stand for... because I was lonely... and trying to fill my time with something I was passionate about. These days, I like myself, which changes my perspective on expressing myself and how I do it. I don't need other people to confirm that for me. These days, I don't need anyone else to tell me I'm a good person worth hanging out with and my opinions are important. I want to be the friend that does that for other people. Somewhere along the line in my treatment, I started telling myself those things to myself. And guess what? I don't care if someone doesn't like me anymore. Good riddance. If you don't like me, you probably have something wrong with you anyway, LOL! And I don't need to post politics on my Facebook for people to notice me and want to talk to me, either. If you don't find me a good enough person or interesting enough to pursue my attention, why would I waste my time with you? I make a damn good friend. And you know what? I think I'll keep up not posting politics on my page for a while. I kind of like what's happened. Snow Day is a Writing Day!